Michael Polanyi was a polymath who primarily studied medicine and chemistry. 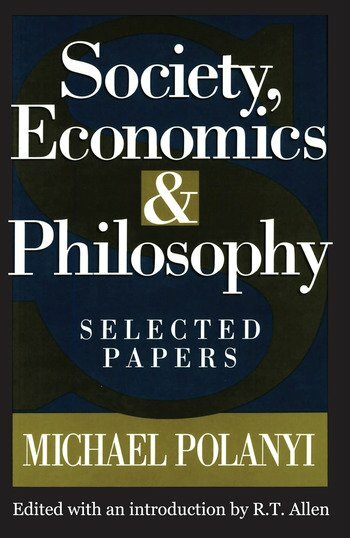 Precisely because of Polanyi's work in the physical sciences, his writings have a unique dimension not found in other advocates of the market and too infrequently found even in philosophers of science. Society, Economics, and Philosophy represents the full range of his interests outside of his scientific work: economics, politics, society, philosophy of science, religion and positivist obstacles to it, and art. Polanyi was a powerful critic of totalitarianism and of the deficiencies of the usual defences of freedom which helped to prepare the way for it. Freedom, he argued, can be based only upon truth and dedication to transcendent ideals, not upon scepticism, utilitarianism, and the liberty of doing merely as one pleases. More radically than even von Mises and Hayek, Polanyi showed that an industrial economy can operate only "polycentrically," that central planning is logically impossible, and that what was called by that name in the Soviet Union was in reality no such thing. Likewise, scientific research can proceed, not by a central plan, but only by the spontaneous self-adjustment of separate initiatives to discover a common reality.